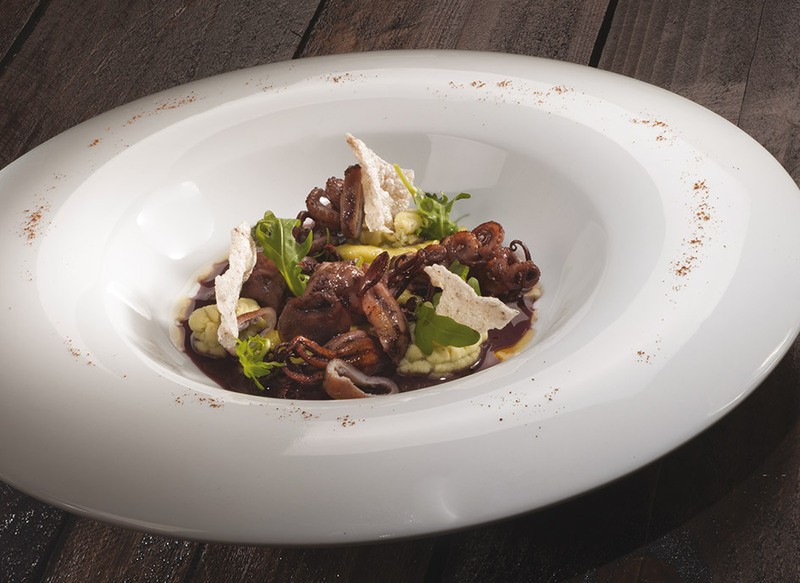 Home / Ricetta / Red wine confit baby octopus with guacamole, broad bean purée and black olive crispbread. Red wine confit baby octopus with guacamole, broad bean purée and black olive crispbread. We start off this editorial with the first of the 12 recipes specially prepared for us by Claudio Sadler, the chef from Milan who is one of the most famous and creative in Italy. A highly refined starter, delicately combining the smell of the sea with authentic earthy flavours. 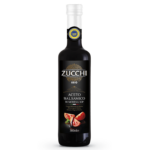 A true culinary speciality in which different types of olive oil, far from being simple ingredients, are among the stars of the dish. Place the rice in a saucepan and add the water and chopped half shallot. Cook over a moderate heat for about 40 minutes, stirring occasionally and making sure it doesn't stick or burn. Liquidize the mixture until a very smooth purée is obtained. Then add the black olives, finely chopped, and spread the mixture onto one or two silicone baking mats. Leave the mixture to air dry for about 2 days until it is well-dried out. Break up the crust and then fry in very hot, almost smoking, extra virgin olive oil until slightly puffed and crispy. Clean the baby octopus, removing the eyes, beak and internal parts. 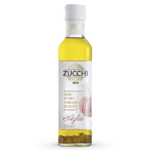 Wash well and put into vacuum bags, adding the extra virgin olive oil and garlic flavoured oil, red wine and a pinch of salt. Seal the bags well. Cook sous vide at 65°C for around 25 minutes. Once cooked, remove the baby octopus from the bags, retaining the liquid. Pass the liquid through a chinois and reduce the sauce. 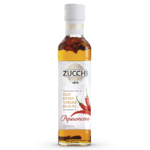 When the flavour has intensified, thicken the sauce using cornflour and add a tablespoon of balsamic vinegar. Purée the avocado in a blender, adding the juice of half a lemon, the chilli flavoured oil, and a little water to obtain a thick purée. Soak the beans in water for about an hour, rinse and cook in water with the bay leaf for around 30 minutes. At the end of the cooking time, add the bunch of rocket and simmer for 2 minutes. Purée the beans and rocket, adding the garlic flavoured olive oil, toasted rosemary and a touch of chilli flavoured oil. Keep warm. Brown the baby octopus in a non-stick pan with a little extra virgin olive oil and salt to taste. Place some of the broad bean purée on the plate, then the guacamole and baby octopus. Pour some of the red wine sauce onto the remaining parts of the plate and garnish with the olive crispbread and wild rocket leaves before serving. 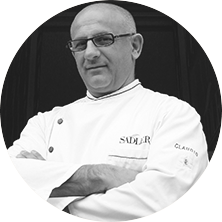 If you'd like to discover other delicious dishes created by Claudio Sadler, you'll find them in Giovanni Zucchi's book Olive oil doesn't grow on trees - The art of blending.